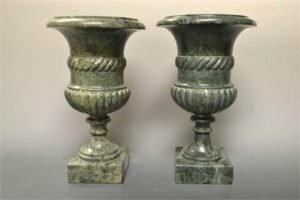 A pair of green marble half-fluted campana pedestal mantel urns, rope-twist girdles, disc socles, square bases. 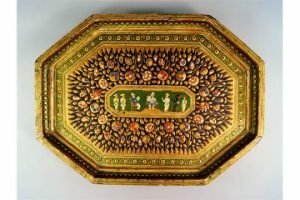 An Indian polychrome-painted gilt and gesso wood tray, Andhra Pradesh, 19th century, of octagonal form, with a central scene depicting two British officers, one seated at a desk, and their two servants receiving guests. 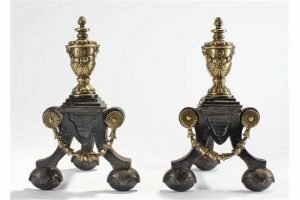 A pair of 19th Century andirons of classical style in brass and cast iron. 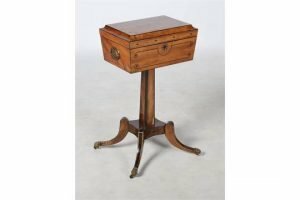 A 19th century mahogany and ebony inlaid teapoy, the sarcophagus shaped top opening to a plain interior, raised on a rectangular column and concave platform base with four down swept supports with brass paw feet and casters. 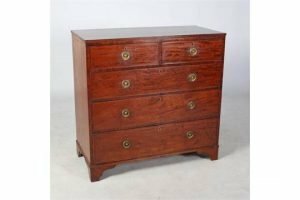 A 19th century mahogany chest, the rectangular top with a reeded edge above two short and three long graduated cockbeaded drawers, raised on bracket feet. 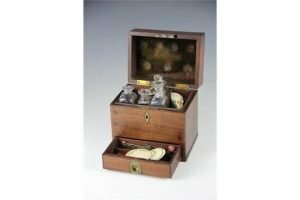 An early 19th century mahogany apothecary chest, with hinged lid and drawer enclosing ivory and steel scales, four bottles, compendium of domestic medicines etc. 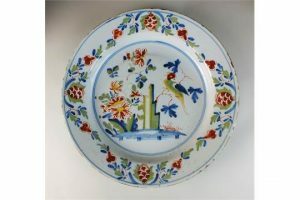 A Lambeth Delftware polychrome dish, mid-18th century, painted with a parrot perched on a branch beside a rock and flowers, fir-cones to the border. 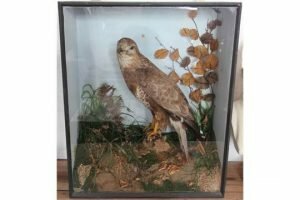 A Victorian taxidermy buzzard, in box case with naturalistic setting, original yellow paper label verso for James Row. 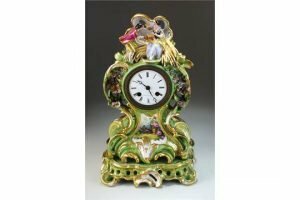 A French porcelain mantel clock and stand, late 19th century, the waisted green-ground case with moulded and pierced gilt borders in the rococo manner, encrusted with flowers and modelled with a pair of lovers with a bird and a cage above. A 9ct gold ruby and diamond bangle. 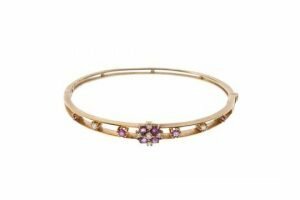 The brilliant-cut diamond and circular-shape ruby cluster, to the similarly-set sides and openwork half-bangle. Estimated total diamond weight 0.30ct. Hallmarks for London, 1988. 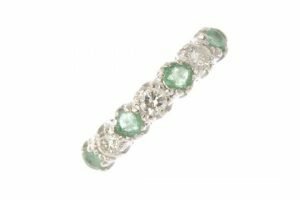 An 18ct gold emerald and diamond half-circle eternity ring. The alternating circular-shape emerald and brilliant-cut diamond line, to the openwork gallery and shoulders. Estimated total diamond weight 0.45ct. 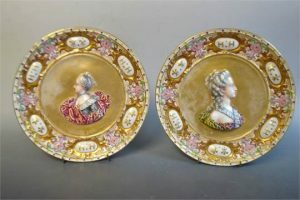 A pair of 19th century Italian portrait plates, moulded in relief with female profiles. 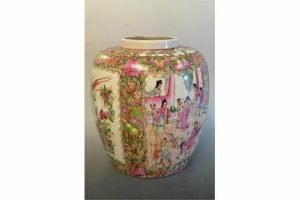 A Canton famille rose large ginger jar, decorated with geisha and noble gentlemen in a garden. 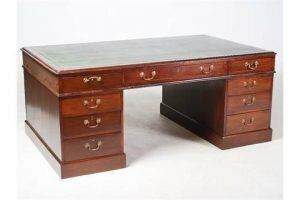 A George III style mahogany partners desk, the rectangular top with a green and gilt tooled leather skiver, above three frieze drawers raised on three drawer pedestals backed with panelled cupboard doors, raised on plinths. 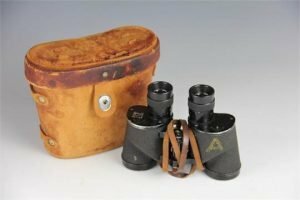 A pair of Mausch & Lomb military issue binoculars, in leather case. A pair of 18ct gold cultured pearl, sapphire and diamond ear pendants. 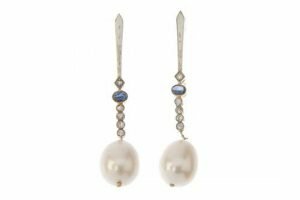 Each designed as a cultured pearl, suspended from a tapered bar, with old-cut diamond and oval sapphire cabochon line spacer. Estimated total diamond weight 0.15ct. 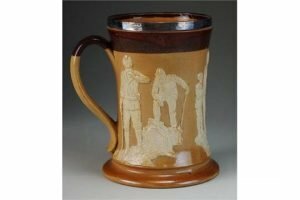 A Doulton Lambeth stoneware mug, early 20th century, waisted cylindrical body applied with golfing scenes, with a silver-mounted rim. 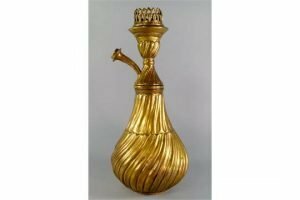 A Turkish gilt copper hookah base, 19th century, the body of bulbous form, with writhen decoration, with pierced crenellated top. 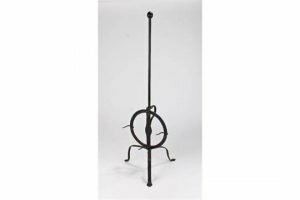 An 18th Century iron lark spit, the long column with ball finial, circular adjustable pronged platform raised above three cabriole legs. 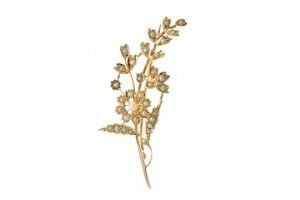 An early 20th century 15ct gold split pearl floral spray brooch. The split pearl flower and leaves, to the curved stem.